First of all, I want to thank the Lincoln Stars organization for a very successful camp, and for making me feel welcome. Special thanks to Stars General Manager Jon Hull for providing me with roster sheets for the main camp. Just like the last few years, I thought the 2014 camp was run extremely well. 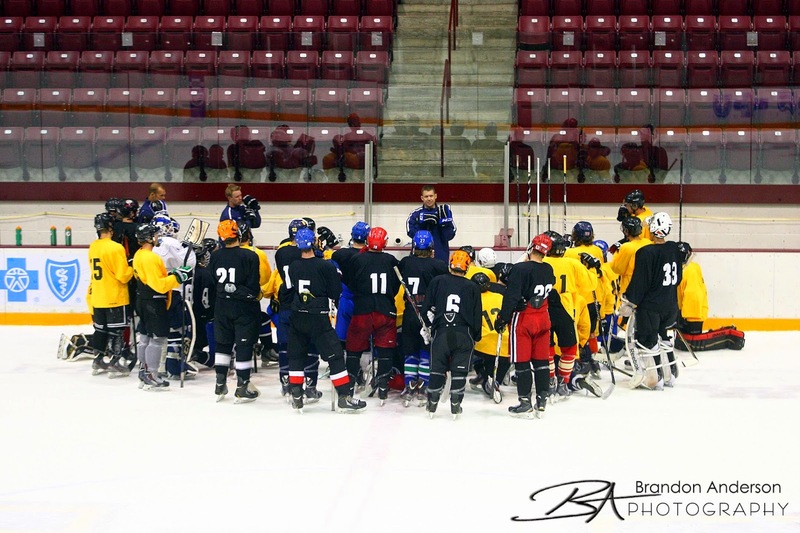 Just about every player parent I talked to at tryouts stated that they thought it was a great idea to hold the camp at Ridder Arena, and the facilities there on campus were top-notch. I know most of the fans in Lincoln wish the camp was still held in Omaha, but I'm convinced that hosting the tryouts in Minneapolis has attracted a number of players who might not have reported to Omaha. I talked to a few parents this past weekend who stated exactly that. They brought their son to Minneapolis because it was easier to fly/drive into. Also, there's no doubt that the players are exposed to more college and pro scouts in Minnesota than they would be in Omaha. So I really hope the Stars organization continues to host this camp in Minneapolis. It's a winner, without a doubt. There was some talk late last season from new owner Ryan Schiff of holding the tryout camp at the IceBox in Lincoln, so it will be interesting to see if that comes to fruition next year. Like any Stars fan, I would really enjoy having a camp here in Lincoln, but the fact remains it is much easier for a player/parent to travel to a city like Minneapolis than it is to Lincoln. There's also no doubt that the facilities in Minneapolis are 10x better than what is currently in place at the IceBox. So what's next? Well, the Lincoln Stars (and every other USHL team) have until July 9th to firm up their 30-player protected roster, along with their 18-player affiliate roster, and send it into the league. On September 1st, that list of 30 players has to be cut down to 25. At that time, the Stars will have a 25-player protected list, and the 18 players on their affiliate list. To understand it a little better, click here to view the protected roster the Stars released after the 2013 camp last year. I believe any player protected on the affiliate list has to have been previously drafted by the Stars (i.e., no undrafted free agents). The 18-player affiliate list next season will consist of ten players born in 1998, six players born in 1997, and two players born in 1996. Players on the affiliate list can be brought up during the regular season by the Stars at any time. The Stars will take those 25 protected players, along with some of the affiliate players, to the "USHL Fall Classic West" tournament which will be held in Sioux City, Iowa on September 19th and 20th. After the mini Fall Classic tourney, the Stars will have to cut down to 23 players and those players will be on the roster on opening night of the 2014-15 USHL regular season. So the cuts are basically, 30-25-23. Between now and early October there could still be a lot of roster-shuffling done. It would not surprise me at all if some trades occur during the offseason. While some other USHL teams will release their protected roster before the 7/9/14 deadline, I doubt we'll see anything released from the Stars until early July. I've already heard of a few players who made the Lincoln roster (via Twitter), but until the Stars put out an official release, I won't be posting any rumors here. As soon as the Stars make it official I will post it here. Like every year, I'll also post my predictions on which players I think make the roster. I'll do that before the 7/9/14 deadline. Speaking of early July, sometime that month the USHL should release the 2014-15 regular season schedule. It's always interesting to look over the new schedule when that's released. I've got a couple of blog articles I'm working on that should be posted this weekend sometime. The first is my annual "B³ tryout camp all-star team," in which I will highlight some of the top non-veteran players who caught my eye at camp. I'll also post an article recapping the two preseason tournaments the Stars will play in this September. If I missed anything, please leave a blog comment or send me an email at lincolnstarshockey@gmail.com. Do you have any idea why Brandon Smith wasn't at tryouts? I have no idea. I wouldn't even want to guess.